When I cast on this sweater, a week ago Sunday, I wanted to see if I could whip out a sweater in a week — as a palate cleanser and personal challenge (what can I say? I’m a masochist) — if I went with the world’s simplest construction. No neck shaping, top down, bulky. Just cast on and go go go. By that Thursday I was too sick to knit, and after posting the top-left image here on Friday morning, and commenting about how I wasn’t happy with the raglans, I feared the week was a wash. Friday night I knit half a sleeve. Saturday I frowned at the whole thing, ripped it back to the neck, rewound the yarn and did a little math. Sunday I started the yoke all over. On me, at least, and in this yarn and color, the neck felt a little retro and I wanted raglans that played into that — with an angle and placement that was more vintage-sweatshirt-like. The first set, on the left, were m1 increases worked every other round. The second set are kfb increases with 2 stitches in between, which makes them simultaneously wider (more in keeping with the proportion of the sweater) and less pronounced. To get the slope I wanted, I worked them every third round, then picked up the pace for the last few, causing them to bend toward the armpit more naturally at the bottom of the yoke. And they begin lower on the neckline (more sleeve stitches to start, fewer front and back). As a result, I’ve got no bunching around the underarms! And a new motto: You’ll never regret taking the time to get it right. Since it didn’t turn out to be a one-week sweater, I thought maybe I could at least finish it in January but, alas, didn’t happen. While it’s much farther along at this point (quite a bit farther than this), I’ve still got hours of knitting to do. If all goes well, maybe I’ll get to show you the finished product next week. Have a great weekend. As always, I’d love to hear what you’re working on! Love the new raglan style. It does suit that yarn much better. Hey, sorry to hear you’ve been sick. Hope you’re feeling better now. The “after” is soooo much nicer! Love what you did. I agree that the revised version seems to look much more “right.” I’m working on a cowl that I started about a month ago – so a sweater in 2 weeks is amazing to me. Heya, got a bug on this end as well, so totally feeling your pain! Redoing the raglans was well worth it…it looks so much better they way you have them now. It’s a shame you got sick, but I think it’s better to have a sweater that you’re happy with than to stick with something you may not wear just to make an arbitrary deadline. It looks fantastic, by the way. Thanks, everyone — feeling a million times better this week than last. Plus it’s 67 degrees here today! I’m clinging to the notion that if I finish the sweater by Sunday night, I still made it in a week. The previous week was some other sweater I happened to have been making with the same yarn. Right? RIGHT? It’s Malabrigo Chunky. Do you guys carry it? Why is it so hard to come by? We don’t have it unfortunately-it’s so squishy good! Most malabrigomis hard to come by from what I’ve heard. It comes from a long ways away…and they just aren’t as proactive/get it here yesterday as the rest of the world I think. Which translates into shop owners unable to keep it and keep the space free on shelves between orders…not very concise or pretty but I think that’s it! Working on Levenwick and the Churchmouse Yarn & Tea Poncho. Thank you for posting the two different style of Raglans, I agree with you, the Kfb looks better. I love that poncho. I’ll have to look up Levenwick. Hi, I was wondering what’s the difference between knitting the increases every other row and every three rows… aren’t they kind of the same, or did you knit the increases on the wrong side of your sweater? They’re just one row farther apart — the rate of increase is a hair slower. This one was knitted entirely in the round, so they were all worked on the right side. But if you were doing every third row on a shaped neck, that would mean some of them would fall on the wrong side rows. Excellent!! thanks for clarifying so quickly!!! Let me ask you one more thing, if I wanted to have less positive ease than yours, how would I go about that? 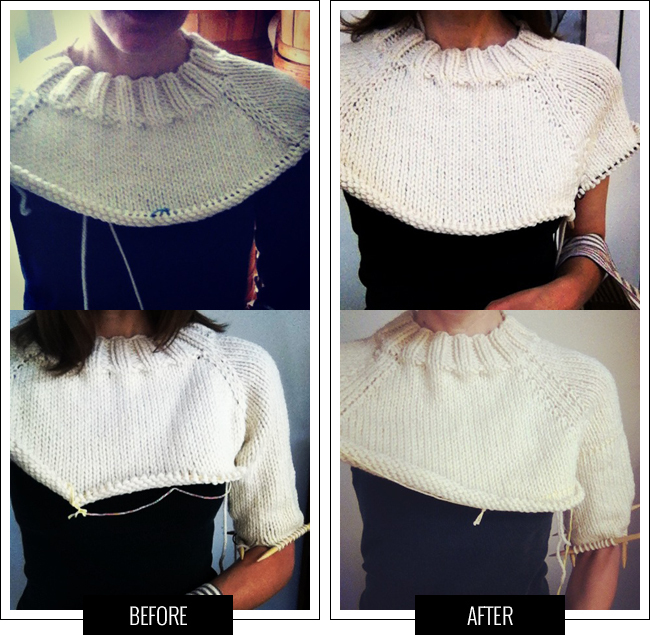 Is it like just knit until it fits nicely at the underarms? Or should I stop the increases sooner?